Image Size: 40"w x 24"h.
This Ute Indian was native to the territory that is now Utah, a region that still bears humanoid-shaped petroglyphs carved into rock, which feature broad shoulders, tapered or triangular torsos, headdresses and short, thin lower extremities. We don’t know for certain the meaning of these images. The petroglyphs are interpreted differently by different experts. The artist calls attention to the similarities between the horned headdress and shield of the “ancient ones,” and that of the Ute. The spirals could be the sun or they could represent migration. Behind the scalp which hangs from the Ute's spear is a carving of a figure holding a circle that has one quarter filled in. One quarter may represent fertility and the rest drought. 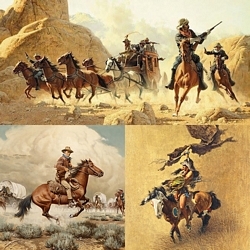 The Fine Art Edition of "In the Land of the Ancient Ones" will set the owner in the continuum of the history of man and the American West, one culture, layered upon another and the Western painting of Frank McCarthy providing the final link to today.